I'm fond of thinking of the Web as a city. Seeing the Web as a city helps make sense of each aspect of online life and how we create and interact. Corporate sites are the storefronts on main street peddling wares. Craigslist is like the bulletin board at the entrance of the corner store; Ebay, a garage sale; Amazon, a bookstore replete with patrons anxious to give you their two cents. Mainstream media sites like The New York Times online are the newspapers of the city. Chatrooms and forums are the pubs and salons of the online world. You've even got the proverbial wrong-side-of-the-tracks spots via the Web's adult-entertainment and sp*m underbelly. Viewing the Web as a sprawling city with social media as the cocktail parties helps to make sense of the best ways for marketers to use the tools of social media. How do you act in such a situation? Are you helpful, providing valuable information to people with no expectation of something tangible in return? Do you try to meet every single person or do you have a few great conversations? 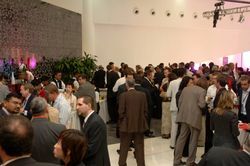 Or do you avoid the social interaction of cocktail parties all together because you are uncomfortable in such situations? I find these questions are helpful to people who are new to social media. This analogy is a good one to discuss with social media cynics and those who cannot see the value of this important form of communication. The Web as a city approach is especially important when dealing with people who have been steeped in the traditions of outbound marketing – interrupting people to talk up products and using the coercion techniques of advertising. Sure, you can go to a cocktail party and hit everyone up as a sales lead while blabbing on about what your company does. But that approach is unlikely to make you popular. Guess what? The popular people on the cocktail circuit make friends. People like to do business with people they like. And they are eager to introduce their friends to each other. So go ahead and join the party. But think of it as just that – a fun place where you give more than you get. But what you get in return are lasting friendships, many which lead to business opportunities. UPDATE: A few minutes after I sent this post, I learned (via @johnvlane) that there is a book with the same title as this post. I have not read the book and I do not recall seeing it. I probably should have Googled the blog title first. Apologies to Jim Tobin & Lisa Braziel authors of the book Social Media is a Cocktail Party. I should read it!